Leap into style. Whether you're a nature lover, or frogs just hold a special place in your heart, you'll really adore this Funky Green/ Red/ Clear Crystal Frog Brooch In Gold Plating. So leap for joy when and unleash your wild side! 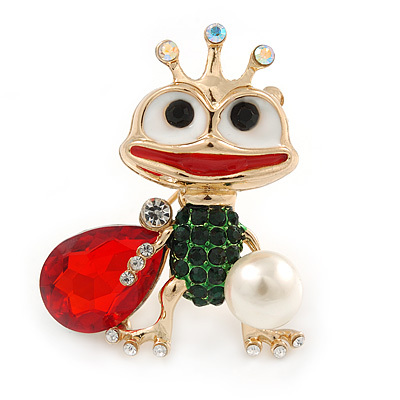 Featuring a frog with a tennis racquet and ball design, crafted in gold plated metal and garnished with crystals in hues of green, clear and red. The frog measures approximately 43mm L x 35mm W, and secures with a rotary safety clasp.